Pictures of Palermo Cathedral. 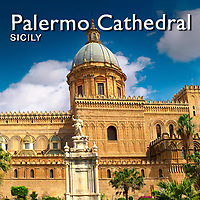 Images & photos of the medieval Palermo Duomo. Also buy stock photos & photo art prints. The church was erected in 1185 by Walter Ophamil (or Walter of the Mill), the Anglo-Norman archbishop of Palermo and King William II's minister, on the area of an earlier Byzantine basilica. The upper orders of the corner towers were built between the 14th and the 15th centuries, while in the early Renaissance period the southern porch was added.